The trade deadline has passed and most leagues have dealt with the final trades for the season. Now, it’s down to crunch time. Most teams know where they’ll end up in their leagues come season’s end and while the top dogs fight for the money, the bottom feeders will step back and reconsider their season of decision making. With that in mind, let’s take a look at what kind of fantasy topics are hitting the web in this edition of THW’s Fantasy Findings. It’s far too early to determine the outright winners of this year’s trade deadline – at least for the most part. But it may not be as difficult to figure out the winners and losers when it comes to fantasy value. Some of the winners didn’t even move on deadline day. Instead, they benefited from a teammate being traded. In a piece on Yahoo, Dobber Hockey breaks down the winners and losers from the majority of the trades from deadline day. In some instances, there still is no clear winner, like Patrick Maroon heading to Edmonton. While the departure of John-Michael Liles helps the development and growth of players like Noah Hanifin and Jaccob Slavin in Carolina. Even in the James Reimer trade to San Jose, Garret Sparks benefits in Toronto while Martin Jones takes a hit as the Sharks’ starter. The biggest piece of advice is to sometimes ignore the actual players involved in the transaction. Look at the winners of these trades – Hanifin, Slavin, Nathan MacKinnon (from the Boedker deal), and Sparks. All of these players were beneficiaries of moves involving other players. It doesn’t hurt to look at the team as a whole following the trade deadline. How does their powerplay break down? Who’ll be getting the majority of the minutes? Is there a new starting goalie in town? These questions will help in finding those late season free agents that will help with the final push. Guys like Justin Schultz might actual be useful to a team suffering from injuries and owners who might need that depth defenceman down the stretch. But see what Dobber has to say on the matter. Who were the true fantasy winners and losers of this NHL trade deadline? Like Dobber, Rick Roos and Ian Gooding over at Sportsnet broke down the fantasy value of some of this year’s biggest trades at the deadline. How will Kris Russell look in Dallas? How will Boedker fit in with the Avs? And is Lee Stempniak the real deal in Boston? According to Roos and Gooding, Russell’s impact in Dallas won’t be an offensive one. In fact, if your league deals with blocked shots, Russell may be the guy you want to look at (projected to get 71 blocked shots with Dallas, according to the Sportsnet article). Boedker looks like he could be a depth player for the Avs down the stretch. 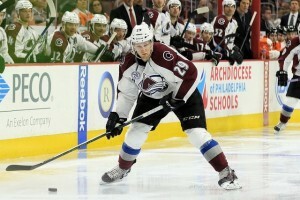 While he won’t put up massive numbers, he will see powerplay time and play alongside MacKinnon. As for Stempniak, he’s having one of his best seasons since his St. Louis days. Is Boston a place he can thrive for the remainder of the season? His ice time will definitely dip and therefore his offensive output likely will too. Like any free agent, those traded on the deadline should be reviewed stat-by-stat when an owner is looking to add them to their fantasy team (via trade or waivers). Players like Stempniak don’t excel offensively when their ice time is cut down. Others like Boedker are entering better situations with highly skilled linemates – how will that affect a players offensive numbers? Take a look at how your league measures statistical value. If you’re in a rotisserie league or a points based league that uses hits and blocked shots, guys like Russell are more useful than a league where it’s strictly based on goals and assists. If they’re joining a team where they won’t play, take that into consideration. That being said, an article such as the one put together by Roos and Gooding is also a great way to help in picking up and targeting those depth players as you head towards a championship in your fantasy league. For more advice, check out THW’s fantasy homepage or follow Andrew on Twitter at @AndrewGForbes.